I am happy to announce a new addition to the Werit family, a new gaming system! My old system, which I had since before WAR and my first daughter was starting to show its age. It was a good machine, but it was time to make a move. It just so happen to by around the time of Cyber Monday, so I was able to get some decent deals. In the past, I have often gone to Dell for my computer needs. I never had a problem with them and their systems were decent. 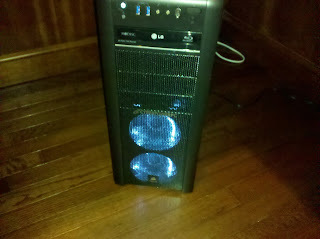 This time I switched things up a bit and went with CyberPowerPC instead. They had some good reviews and some nice deals. I figure this bad boy should last me at least another 5 years. It's got a big power supply (900 watt I think) so upgrading the graphics card in a few years should be a non-issue. So far, it has been handling everything great. WAR and SWTOR have performed great on their high settings, as have other games I've tried. Hearts of Iron 3 loads very quickly compared to my old system, which was a nice surprise. I'm really looking forward to see how it does rendering videos. I'll be able to try it out soon, as I have the next WeritCast ready to go.